The monthly ArtSmart Roundtable brings together some of the best art-focused travel blogs to post on a common theme. This month we are focusing on Artistic Periods or Movements. Check our the other periods we’ve picked by looking at the all the ArtSmart posts below. This month we welcome a new writer to the ArtSmart team – Alexandra of ArtTrav! Alexandra is based in Florence, Italy and is an art historian turned blogger. We are super excited to have her in the group! I definitely have my favorite and not so favorite periods of art (I’m looking at you French Rococo). I like drama without being intense. I like skilled painting but a step back from photographic realism. I definitely like good use of light and dark space on a canvas. And so I love the Spanish Baroque. It’s not quite clear to me if the Spanish Baroque painters were fully aware of what was being made in Italy at the start of the 17th century, but they appear to have been influenced by it. Active from 1595 – 1610, Caravaggio was a major transitional figure in art moving from exaggerated Mannerism to a highly naturalistic style, illuminated with powerful light and shadow. This dramatic use of light to intensify an image, also known as tenebrism, clearly influenced Spanish artists of the era. Take a look at the images above of St. Francis meditating with a scull by Caravaggio (top) and Zurbaran (bottom). Both use a somber brown palette and lighting extremes while at the same time conveying emotion in the face and pose of the figure. While Caravaggio’s work is expertly and hyper-realistically painted, it gives the impression of staged performance, perhaps like a human still-life. I find Zurbaran’s Francis to be far more natural with his somber expression even if I can’t see every wrinkle on his face. The loosening of the brushwork in his robe actually helps dissolve his body in a less defined shape which point our gaze right up to his eye. The iconic members of the Spanish Baroque are Francisco Ribalta, Jusepe de Ribera (who lived in Naples), Francisco de Zurbaran, Bartolomé Murillo, and of course Diego Rodriguez de Silva y Velazquez. Working in the 17th century, these artists filled the Spanish court and religious building with powerful but softly natural divine portraits, noble portraits and even mythological images. Departing from Caravaggio’s extreme lighting and highly realistic painting style, the Spanish Baroque embraced softness in their brushwork and treatment of their figures while painting with a dark, Earthy palette. 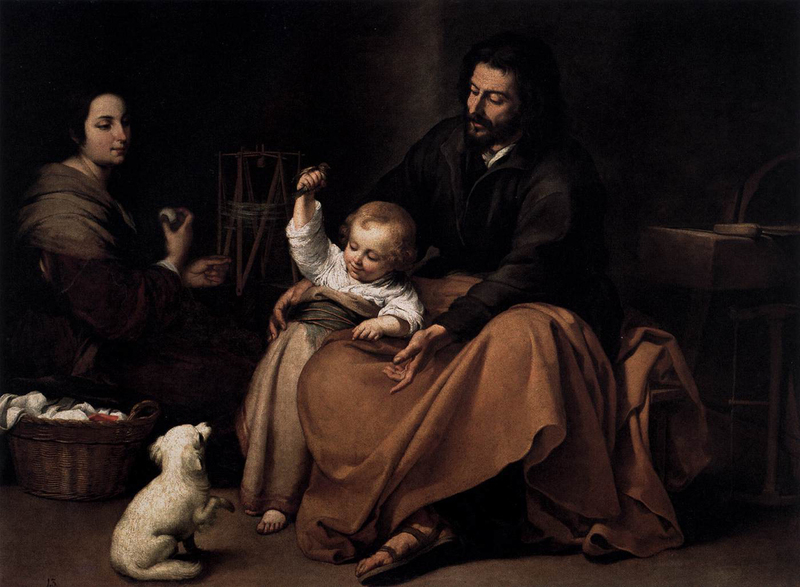 By far, the best collection of Spanish Baroque paintings is at the Museo del Prado in Madrid. With any luck I’ll be making that art pilgrimage soon! Jenna of This Is My Happiness – Arts & Crafts Movement in the U.S.
Jenna of This Is My Happiness – The Arts & Crafts Movement in the U.S. Paintings from this period are incredible when seen in person. The last time I saw some was at the Museum of Art in Sao Paulo, Brazil–not where one would expect, but they have some nice examples. Thanks! Sounds like another good reason to visit Brazil 😉 I definitely want to see out more Spanish art in 2014. I don’t usually associate the word baroque with the word natural but these paintings/portraits are both natural and dramatic. Amazing stuff. Thanks Lesley! They’re definitely dramatic! I had to laugh at French Rococo (blech) and the inbred Hapsburgs. I love tenebrism as well! The Spanish Baroque period was only briefly covered in my survey class, so I’ve gravitated towards the Dutch Masters (heart me some Rembrandt) but they both share the plays of light and dark, the loosening of the brush, and a more emotive depiction of subjects. Yes thank you, French Rococo is blech! Great comparison to the Dutch Masters. That periods always makes me think of Frans Hals’ group shots, but thanks for pointing out Rembrandt’s genius. Oh Zurbaran, that guy could paint a still life! I once made the horrible mistake of writing a research paper on Spanish Baroque sculpture. A mistake not because it was Spanish Baroque – I loved the pieces – but a mistake because there wasn’t much of it, haha. And there was only a handful of books and articles for me to read (at least in English). I’ll just say I really felt awful making my professor read that paper! Hmm I’m trying to think of Spanish Baroque artists now and yeah there isn’t a lot. It was mostly religious statuary then probably? Did you hear about this National Gallery of Art show a few years ago? The making of a statue story is one of the best online art features I’ve ever seen! What a wonderful post, Christina! On the other hand, a big portion of Italy was part of the Spanish Crown during three centuries (including the Baroque period); hence there were strong influences in both directions. Really enjoyed this post Christina! I am more familiar with the Renaissance in Venice and how it differed from that in Florence where it began. I’m not at all familiar with these Spanish artists so it was interesting to see the comparison with Caravaggio. Thanks Murissa! While Italy has produced a lot of incredible art, these Spanish artists really were inspired and created something unique and wonderful.